The Panther DC is an accessory for the Sega Dreamcast manufactured by Mad Catz. 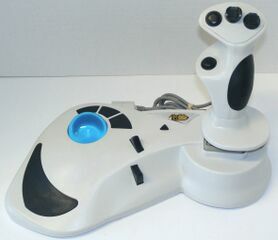 It attempts to combine a flight stick with a trackball along with the various buttons the Dreamcast has on its standard controller (sixteen action buttons in total, it claims) in order to enhance first person shooters and flight simulators, primarily the likes of Quake III Arena, Soldier of Fortune, KISS Psycho Circus: The Nightmare Child and StarLancer. The Dreamcast only has one analogue stick, so when these games were designed, developers were forced to experiment with different control options in order to give the player control of both the camera and player. As a result, no two games have their buttons mapped in the same way, and as none of these games were designed with the Panther DC in mind, the Panther DC controls vary considerably between each game. There is a switch on the underside of the unit which toggles between "Panther" and "Standard" mode, which can adjust the button layout, though some issues cannot be solved, like the and triggers, which are mounted in the centre of the unit in an odd fashion. It has a single VMU port at the back of the unit, also if plugged in there is a blue LED mounted in the trackball which lights up. The Panther DC was released in North America, but it is unknown whether the device made it to Europe, despite the numerous translations on the box.